One of the things I love about the rapid pace of technological advancements in the audio industry is that I am always learning: a new keyboard shortcut here, a new way to use automation there, a new modulation routing to yield a new sonic treat. In this sense, my logical and rational brain is always being stretched. But this has always been a double-edged sword for me, because while IÃƒÂ¯Ã‚Â¿Ã‚Â½m always learning new things and new ways to use the tools IÃƒÂ¯Ã‚Â¿Ã‚Â½m given, that is time that could be spent honing my purely musical skills ÃƒÂ¯Ã‚Â¿Ã‚Â½ practicing scales, studying modes, experimenting with new meters, or working with a new melody. In this sense, my creative brain is always left wanting more. IÃƒÂ¯Ã‚Â¿Ã‚Â½ve always thought that having a real piano in my studio would be the simplest solution ÃƒÂ¯Ã‚Â¿Ã‚Â½ the sheer immediacy of the instrument and the relationship a player has to it provides the perfect marriage of the brain hemispheres. Unfortunately my current space doesnÃƒÂ¯Ã‚Â¿Ã‚Â½t allow for The Real ThingÃƒÂ¯Ã‚Â¿Ã‚Â½and thus IÃƒÂ¯Ã‚Â¿Ã‚Â½m forced to stay digital for the time being. In my experience, it is rare in the world of electronic music to find an application or tool that pushes you both creatively and logically the way that an acoustic instrument can. 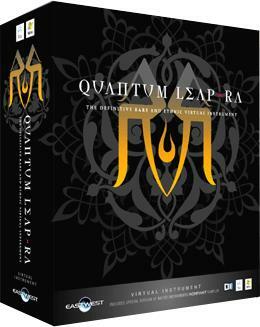 But I am happy to say that I believe I have found just such a tool ÃƒÂ¯Ã‚Â¿Ã‚Â½ a product, that blurs the distinction between tool and instrument and thus challenges both sides of the brain: Quantum Leap RA. East West/Quantum Leap has been putting out astoundingly good sample collections for years, so it is no surprise that this groundbreaking library comes from the same producers who brought us EWQL Symphonic Orchestra, Stormdrum and the Drumkit From Hell. RA is the largest, most complete, and most detailed ethnic sample collection yet compiled, and producer Nick Phoenix and his team have truly outdone themselves with this library. 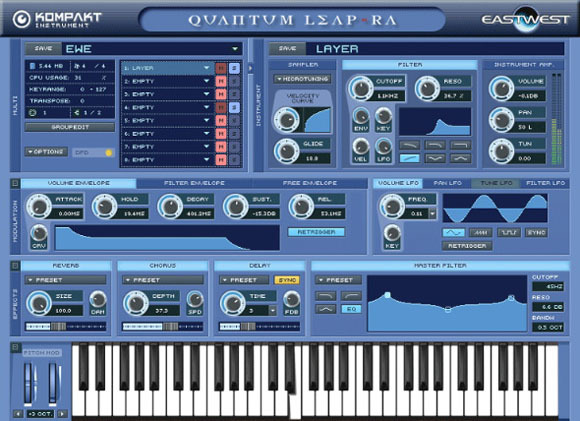 In similar fashion to other EWQL collections of this caliber, RA is a massive 14 Gigabyte Virtual Instrument utilizing the Native Instruments Kompakt player. In its scope, RA covers a broad spectrum of instruments from all corners of the world, including Africa, the Americas, Australia, Europe, China, Japan, India, the Middle East and the Turkish Empire. If you think RA sounds impressive based on the above information or the spec sheets, wait until you open up the 118 page PDF manual. It is here that I first began to realize that RA was not just another virtual instrument, but something that begins to transcend the typical sample library. The manual ÃƒÂ¯Ã‚Â¿Ã‚Â½ provided only in PDF format (save the trees!) ÃƒÂ¯Ã‚Â¿Ã‚Â½ reads like an essay on World Music, providing brief overviews of each sample instrument, its origins, construction, and, most importantly, its use and capabilities in performance. WhatÃƒÂ¯Ã‚Â¿Ã‚Â½s that you say? YouÃƒÂ¯Ã‚Â¿Ã‚Â½ve never seen or heard an Afro-Brazilian Berimbau? The manual not only provides a photograph, but offers a brief explanation of how the instrument is constructed and how the instrument is played. For those inexperienced with any particular instrument in this collection, this brief overview provides invaluable information as to how to accurately and realistically utilize these sounds in your projects. RA provides a number of ways to start using each instrument out of the box. Programs are broken down into 3 basic categories: Keyswitches, Live and Elements. For experimenting and getting a general idea of what each instrument sounds like and how it might be played, the ÃƒÂ¯Ã‚Â¿Ã‚Â½LiveÃƒÂ¯Ã‚Â¿Ã‚Â½ selection is used. These are the most typical techniques and articulations for each instrument, and are designed to be very ÃƒÂ¯Ã‚Â¿Ã‚Â½playableÃƒÂ¯Ã‚Â¿Ã‚Â½ without having in-depth knowledge of the instrument or requiring a lot of tweaking. The Elements folder contains each of the basic programs of the instrument, as well as some special FX programs if youÃƒÂ¯Ã‚Â¿Ã‚Â½re looking for very unique sounds from a particular instrument. Some composers donÃƒÂ¯Ã‚Â¿Ã‚Â½t like to use Keyswitches, so the Elements folder provides an alternative way to access all the sounds available for a given instrument. For those composers who like accuracy and immediacy, however, the Keyswitch programs really show the power and versatility of this library. Each of these programs will typically contain all of the articulations available for the instrument. Through creative playing techniques or post-processing and tweaking of MIDI note data, utilization of the Keyswitch programs allows the full breadth and depth of each sampled instrument to be explored. Using the KS programs a composer can quickly move from aggressive to subtle articulations while still maintaining a flowing melodic line. In my composing, IÃƒÂ¯Ã‚Â¿Ã‚Â½ve found the KS programs to be the most useful. While IÃƒÂ¯Ã‚Â¿Ã‚Â½m certain I could achieve similar results using combinations of the Live or Elements options, the immediacy of the KS programs allows for efficient line writing while exploring the full dynamic range of the instrument. As I began to explore the depth and breadth of this library while using the KS programs, it occurred to me that I was learning as much about the capabilities of the originating instrument as I was about how to actually use and program it within my DAW of choice. As a case in point, one of the included instruments is the Japanese flute known as the Shakuhachi. You might recognize this sound from a variety of film scores, Peter GabrielÃƒÂ¯Ã‚Â¿Ã‚Â½s “Sledgehammer” or from your own collection of world music. Never having seen or played one in real life, my understanding of the instrument was quite limited ÃƒÂ¯Ã‚Â¿Ã‚Â½ until I started exploring the keyswitches. The number of articulations for this instrument is astounding and exploring the variety of effects is half the fun of this library. This instrument in particular has 14 different keyswitch layers, resulting in a roughly 20MB sample. Learning to use these keyswitches effectively in composition is another matter, and a great deal of patience, trial and error, and an occasional stroke of luck is needed. While IÃƒÂ¯Ã‚Â¿Ã‚Â½m certain that actual players of these instruments could easily tell when an articulation is out of place, it is entirely possible to create dramatic and very passable arrangements for a wide variety of instruments if you spend enough time. IÃƒÂ¯Ã‚Â¿Ã‚Â½ve taken the time to whip up a quick demo of one of my favorite wind samples from the collection, the Duduk. Hans Zimmer made good use of this instrument when he recruited legendary Duduk player Djivan Gasparyan for the score to the film “Gladiator”. For this sample, IÃƒÂ¯Ã‚Â¿Ã‚Â½ve used the Bulgarian Duduk (there are three different instruments to choose from), which is one of my favorites. For this sample I used a variety of different keyswitches, all from the same KS patch. I added only a bit of LogicÃƒÂ¯Ã‚Â¿Ã‚Â½s Space Designer reverb to give the patch some additional space. As you can plainly see, this is quite simply an astounding library. There are certainly some gaps in terms of what instruments IÃƒÂ¯Ã‚Â¿Ã‚Â½d personally like to see represented, but given the already huge size of this library, IÃƒÂ¯Ã‚Â¿Ã‚Â½m certain that Nick Phoenix and company could easily create a RA2 and have another hit on their hands. In short ÃƒÂ¯Ã‚Â¿Ã‚Â½ this is quite simply one of the best sample libraries IÃƒÂ¯Ã‚Â¿Ã‚Â½ve had the pleasure of using, and I highly recommend it to anyone who is looking for the absolute best quality ethnic samples short of hiring the musicians themselves.